Judy Blume will be speaking at the University of Hartford on June 21st as a fundraiser for The Mark Twain House & Museum. I’ll be interviewing her onstage and taking tons of audience questions. In preparation, I will be reading her complete works and blogging about the experience. Get your tickets here. When I was in elementary school I was largely left alone. Small and bookish, I was accepted mostly with indifference by my peers, who accepted me simply by their lack of rejection. I recall no schoolyard cruelties when I was very young. Only the squabbles with my close friends-- a completely different kind of childhood stress rooted in actually working out the differences in two personalities-- contributed to my social stress as a child. But as I got a little older, it began to happen. In fifth grade a girl played a practical joke on me and laughed in my face in the lunchroom, and I sat silent as a whole new kind of tears rose up to my eyes, as if from my gut. I have no idea now if she was intentionally singling me out or if it could have been anyone, but the second I cried I took on my stance as a victim. I carried it through sixth grade and seventh grade, and then, desperate to keep my head above water, I started being a little bit mean to others. Not cruel. Exclusive. A follower. A silent witness to other people's meanness. I was a part of kicking a couple of girls off a 6-seat-only-lunch-table, and I will feel awful about it forever. It didn't last long-- I raced back to good friends, nice friends, very quickly, and they helped me accept that I would never be cool but I could absolutely be nice. We sat at a lunch table so long there were always empty seats for those who'd been booted off the six-seaters. I was happy for this redemption but I always carried the knowledge of how to be mean inside me. Sometimes I still fight it off. "My best friend, Tracy Wu, says I'm really tough on people. She says she wonders sometimes how I can like her." From here on we get all sorts of judgments from Jill. Donna's got a thing about horses. Robbie doesn't laugh like a normal person. 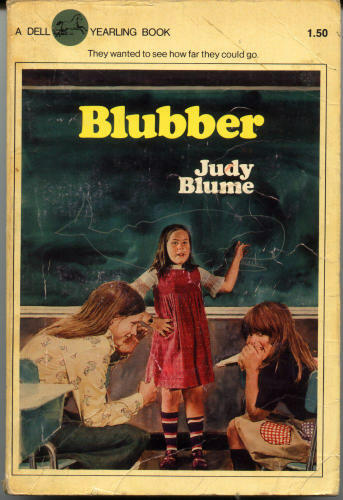 But mostly, her classmates are mean to Linda, an overweight kid who has the unfortunate assignment of reporting on whale blubber. The rest of the book is Jill's descent into being a passive bully. First she does nothing to help Linda. She laughs along with the others, she participates in small ways. I'm not going to ruin the book, because it is absolutely worth a read, but Jill descends very slowly and very surely from complicit to cruel before our eyes. It is realistic because it is barely perceptible, particularly to the adults around them. To stop bullying, we have to stop the bullies. Not in their tracks, but in their creation. We have to move our children more swiftly to empathy and kindness. Any good book about bullying, any that will make our kids better, will likely be from the point of the bully. We must see how our own cruel tendencies can come out and how fast they can turn on us. We must see how being an adult means not that we are angelic, but that we work hard to be conscious of how we treat people around us. Sometimes we all have to be reminded.